At Nazareth, we guide our diverse clients through a full range of tax planning and preparation decisions with strategies to minimize your tax liabilities, maximize your cash flow and place you closer to your financial goals. Our expertise, experience, analysis and thorough research allow us to optimize financial opportunities to be found in existing as well as recently altered tax laws. We are knowledgeable and up to date on the various tax laws and can make sense of your receipts, bills and notices. We understand how tax regulations apply to businesses in various industries and how to implement tax planning methods that will reduce your liability. Our clients and services cover many continents as well. As an experienced international tax firm, we are well-versed in current tax laws and their implications on companies doing business across borders. We take the time to learn about your organization and carefully assess your tax obligations to be sure you’re operating in a tax-friendly manner. From early-stage tech startups to established enterprises, companies rely on accurate and transparent financial information in order to maintain profitability and capitalize on new opportunities. The full-service accounting services offered by Nazareth will steer you closer to these goals with precise record-keeping and reporting as well as support on financial issues such as tax planning, investments, and international ventures. Choosing the appropriate tax structure is an important aspect of growing a successful business. At Nazareth we strive to help you get all the tools and information you need to get your business on the right path to unencumbered growth. Cecil Nazareth ACA, CPA, MBA has an outstanding worldwide reputation as a teacher, lecturer, practitioner and mentor. He has led hundreds of training sessions and seminars about international tax and accounting and he has helped countless young professionals advance their careers in the CPA profession. In today’s hyper-speed global economy, every practitioner should have a basic understanding of international tax regulations. The rules change constantly and the penalties for non-compliance are steep as all too many have learned via Foreign Bank Account Reporting (FBAR) has taught us. All business is global. Unfortunately, the severe shortage of knowledgeable international tax professionals leads to poor decisions and non-compliance at both the personal and corporate level. Due to a lack of resources and understanding, non-compliance can be both voluntary and involuntary. Thanks to thought leaders like Cecil Nazareth, however, the knowledge void is being filled. I highly recommend Nazareth’s book to both tax practitioners and individuals who need a basic understanding of International tax issues or cross-border transactions. This publication could not have come at a better time! International tax compliance has become a major focus for the IRS and for intergovernmental agencies. The Panama Papers and the Paradise Papers are just two high-profile examples of the increased spotlight on international tax havens. 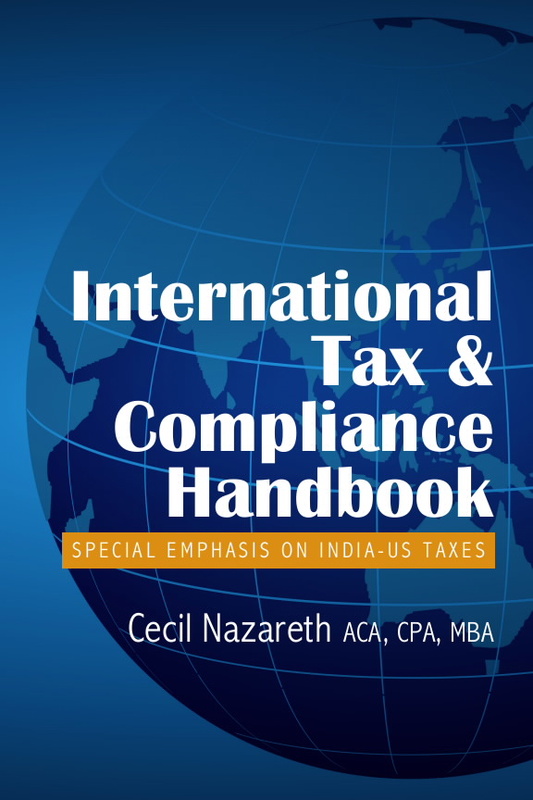 International tax and compliance handbook is an excellent introduction to international taxation with a special emphasis on India-U.S. taxation and international real estate. Nazareth’s book is intended as a handbook for those engaged in international transactions. Rather than a textbook, International tax and compliance handbook is a light read and resource for people who want to get up to speed quickly on international tax rules and compliance. The forms and templates are helpful to practitioners and the book is chock full of useful tips, charts and real-world client examples drawn from Nazareth’s 30 years in the CPA profession. I look forward to future updates of this body of work. It is a significant contribution to our profession.